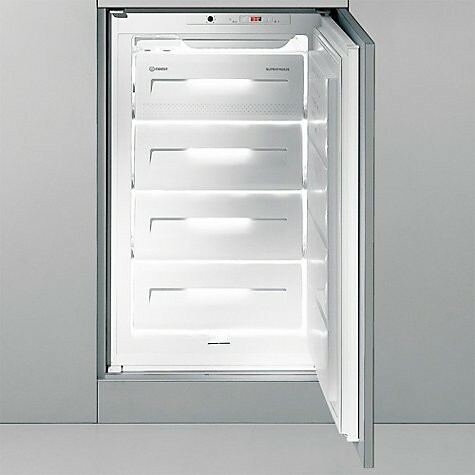 The built-in Indesit INF1412 Freezer has four compartments and 84 litres of net storage capacity. The SuperFreeze function lowers the temperature in the freezer to its lowest value for a short period of time. This is used to accelerate the freezing process of fresh foods and thus preserve their original qualities. As soon as they reach their frozen state, the temperature can be returned to normal by pressing the button again. If, however, you should forget, the freezer will automatically revert to the ideal temperature after a short time. The freezer’s temperature is constantly monitored: a buzzer sounds when the internal temperature increases beyond the optimal conditions for preserving your food. It is rated A+ for energy efficiency making it kind to the environment and your wallet. The door is reversible to fit your kitchen layout.